The Docs & Photos Form is used to upload files for storing in DT_FILE. These files may include images that can then be associated with a location or location types, spreadsheets or templates for use in report output. The file type associations are stored in RT_FILE_TYPE. Click on the Forms button and complete the steps below. 2.Navigate to where the file or files are located. 3.Select the file or files. 4.Click on the top button to transfer the files to the database. This will create a new record in DT_FILE associated with the file that was uploaded. 5.Close the Docs & Photos window. It is also possible to download the files by clicking on the bottom button. In the record of the image file, the following steps will associate an image file to a location. 1.In the PLACE_TYPE field, enter "sys_loc_code". 2.In the PLACE_CODE field, enter the sys_loc_code value (e.g., B-30). 1.Add "LOCATION_TYPE_CODE" to the "PLACE_TYPE" field and the name of the location type in the PLACE_CODE to the record of the image file. This information can be found in RT_LOCATION_TYPE. 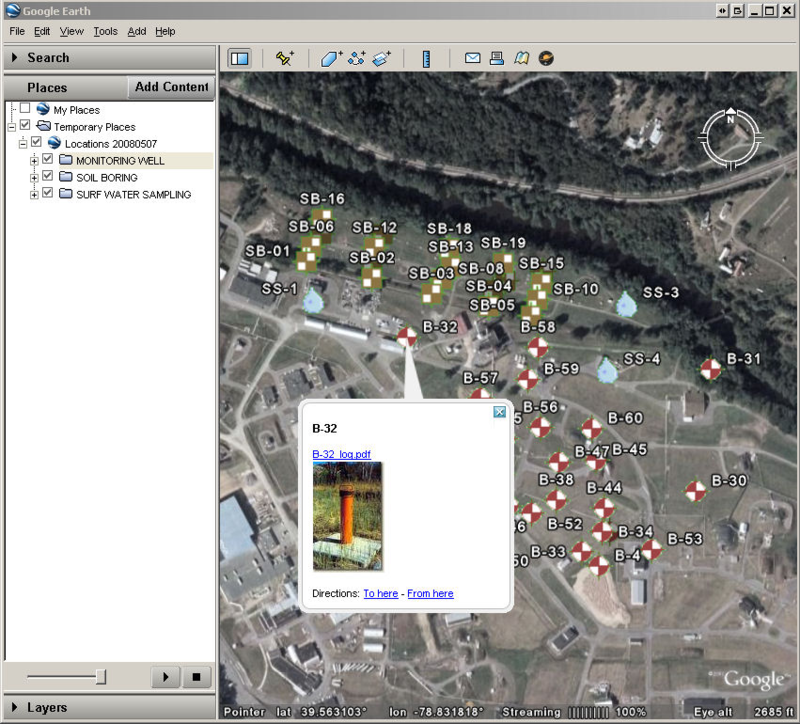 2.Select the Google Earth: Locations Report. Google Earth should open and navigate to the locations. 1.Click on your location on the Map Widget and the link to the file will be shown in the Info Table. 2.Click the link to download the file. Additional Information: Sorting Docs and Photos in Enterprise now also includes the DISPLAY_ORDER field. If your locations do not display on the map, confirm that the locations are present in VW_LOCATION. DT_FACILITY has to have the following fields populated: DT_FACILITY.IDENTIFIER and DT_FACILITY.COORD_TYPE_CODE in order to properly populate VW_LOCATION. For more information on how VW_LOCATION works, please read VW_LOCATION Toolbar - GUI and Identifier.